The world is going the silicon way, with the increasing use of wireless equipment for remote sensing and data collection equipment in various industries; the problem that arises is the replacement of the batteries in the equipment, especially when the site is in remote and inaccessible locations like Oil pipelines, industrial machinery and bridges. The best solution to the problem is to harness the energy around the equipment itself; like ambient light, electromagnetic radio-waves which are almost everywhere these days and mechanical vibrations. Mechanical vibration energy is pretty significant in industrial machinery, pipelines and bridges. Harnessing the vibration energy could make replacing batteries redundant. Researchers at MIT have designed a device that's the size of a U.S. quarter coin and harvests energy from low-frequency vibrations, such as those that might be felt along a pipeline or bridge or the humming of a machine. The tiny energy harvester technically known as a micro-electro-mechanical system called in short as MEMS, picks up a wider range of vibrations than existing designs and is able to generate 100 times the power of devices of similar size. Now these kind of vibration energy harvesters are nothing new, researchers have been using Piezoelectric material like quartz and other crystals to make such kind of devices. These piezoelectric material naturally accumulate electric charge in response to mechanical stress applied on them. In recent years researchers have been using a piezoelectric material called PZT (Lead zirconate titanate) for engineering MEMS devices that generate small amounts of power. In the exiting harvesters engineers use a cantilever approach for harvesting the vibration energy. 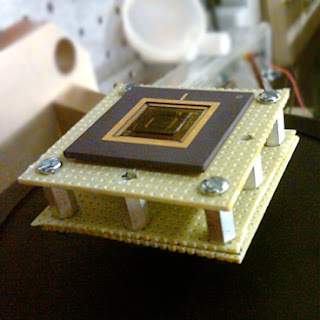 A small microchip with layers of PZT is glued to the top of a tiny cantilever beam. As the chip is exposed to vibrations, the beam moves up and down like a wobbly diving board, bending and stressing the PZT layers. However the design has its limitation; The cantilever beam itself has a resonant frequency, a specific frequency at which it wobbles the most. Outside of this frequency range, the beam’s wobbling response drops off and as a result the amount of power that can be generated also reduces significantly. So something that produces power at various frequencies had to be designed to harvest power at the best levels. Sang-Gook Kim, a member of MIT’s Microsystems Technology Laboratories and Arman Hajati who conducted the research as a PhD student at MIT came up with a design that increases the device’s frequency range, or bandwidth, as a result maximizing the power density, or energy generated per square centimeter of the chip. Instead of taking the classic cantilever based approach, the team took a different route by engineering a microchip with a small bridge like structure that’s anchored to the chip at both ends. The researchers deposited a single layer of PZT to the bridge, placing a small weight in the middle of it. In vibration testing the research team found that the designed generated electric power at a wide range of frequencies which amounts to 45 microwatts of power with just a single layer of PZT an improvement of two orders of magnitude compared to existing designs. This design also brings down the cost of manufacturing which gives it a major advantage. For further development the team plans at optimizing the design to respond to lower frequencies and generate more power. Arman Hajati who is currently a MEMS development engineer at FujiFilm Dimatix says the target is to achieve at least 100 micro-watts of power which is enough power a network of smart sensors on a pipeline making them work forever without maintenance.